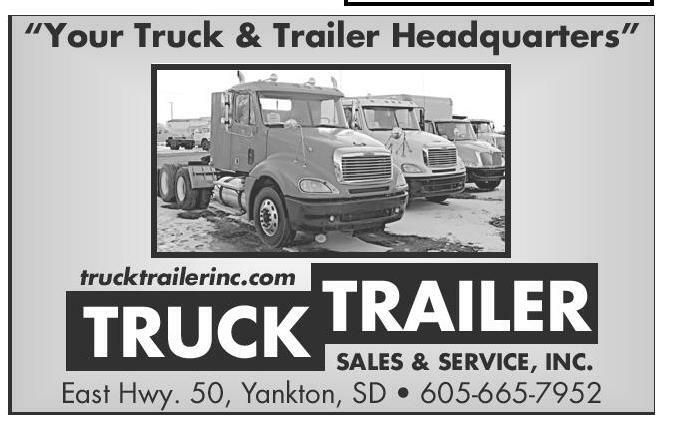 Truck Trailer Sales and Service Inc.
March 19, 2013 • Page 9 shop online at www.missourivalleyshopper.com 1700 Merchandise 1755 Clothing 1780 Items Wanted For sale by high sealed bid by the State of South Dakota Commercial kitchen equipment-used- located in Yankton, SD. Items include: Kolpack walk in freezer and cooler, Hobart dishwasher, Greenheck exhaust hoods, & more. Bids will be opened at 2:00 P.M. CST on April 4, 2013 in the Central Services Building, 1320 E. Sioux Avenue, Pierre, SD. For bid information: www.sdsurplusproperty.com Prom Dresses: 1-Royal blue with back corset closure, 1l light blue. Both are strapless, floor length, sequin embellishment, size-8 worn once. Very nice dresses $100/each. 1-Pink floor length strapless $50. (605)369-2340 Want to buy: JD 7000, 7100 Planter; JD 875, 885 Cultivator; JD 1100, 960 field cultivator; chisel plow; grain drill; small square baler. (605)665-4753. 1760 For Sale: Electric Murray snowblower (605)665-5647. 1705 1765 Items $100 or Less Oak Bath vanity 36” with white marble top $75. Bath mirror 36x36 $25. Call (605)660-7188. 1710 Electronics LOWER THAT CABLE BILL! Get Satellite TV today! FREE System, installation and HD/DVR upgrade. Programming starting at $19.99. Call NOW 1-800-935-8195. nani Entertainment Items Wanted to Buy: VCR with remote in good working condition, $50. (605)260-3799. Antiques - 1775 Home Furnishings Collectibles Beautiful queen size bedroom set $550. Must see to appreciate. Call (605)661-7663. QUALITY FURNITURE SALE 8’ Oldhausen slate oak pool table $900. Computer desk with hutch, expresso color, $300. Call (605)664-1273 leave message if no answer. Vintage dresser 48x22x34. Two deep 7” drawers. Three smaller drawers. $150/firm. Call (605)664-7577. 1780 Items Wanted 1950-1955 Wurlitzer Jukebox, send information to: PO Box 269, Yankton, SD 57078. Call Classi?eds 665-5884 WANTED Buying all types of SCRAP IRON Farm Machinery • Cars & Trucks References Available • Top Market Prices Paid Home: 402-945-1512 • Cell: 402-533-3640 K&K Iron & Metal 1790 1795 Lawn - Garden Musical Items **OLD GUITARS WANTED! ** Gibson, Martin, Fender, Gretsch, Epiphone, Guild, Mosrite, Rickenbacker. Prairie State, D'Angelico, Stromberg, and Gibson Mandolins/Banjos. 1920's thru 1980's. TOP CASH PAID! 1-800-401-0440. nani Free: Upright piano and electric organ. You move (605)665-5787. 1800 Sports Equipment AMMO FOR SALE: Misc. rifle, pistol, shotgun ammunition. Reloading supplies, police and military & hunting items. Antique coins. Silver. Too much too list. Call or text (605)421-1641 or email gspulse@yahoo.com. 1815 Miscellaneous STEEL CULVERTS FOR SALE: New, All sizes. (605)661-5050 or (605)387-5660. Ulmer Farm Service, Menno, SD. AIRLINE CAREERS begin here - Become an Aviation Maintenance Tech. FAA approved training. Financial aid if qualified - Housing available. Job placement assistance. Call AIM (888)686-1704. nani 1815 Miscellaneous 1815 ATTEND COLLEGE ONLINE from Home. *Medical, *Business, *Criminal Justice, *Hospitality. Job placement assistance. Computer available. Financial Aid if qualified. SCHEV authorized. Call 800-401-2385 w w w. C e n t u r a O n l i n e . c o m (MCN) ATTEND COLLEGE ONLINE from Home. *Medical, *Business, *Criminal Justice. Job placement assistance. Computer available. Call 800-510-0784 www.CenturaOnline.com nani Bundle & Save on your CABLE, INTERNET PHONE, AND MORE. High Speed Internet starting at less than $20/mo. CALL NOW! 800-291-4159. nani CASH FOR CARS: All Cars/Trucks Wanted. Running or Not! Top Dollar Paid. We Come To You! Any Make/Model. Call For Instant Offer: 1-800-864-5960. nani DIRECTV Lowest Price! FREE: HBO® Starz® SHOWTIME® CINEMAX ® 3mo + HD/DVR to 4 Rooms! $29.99/mo+ 12 mos. 24/mo.contract, Ends 4/3/13 888-248-4052. nani DIRECTV, Internet, Phone $69.99/mo+ 12 mos. 24/mo.contract FREE : HBO® Starz® SHOWTIME® CINEMAX ® 3mo + FREE HD/DVR Features 4 Rooms! Ends 4/3/13, 888-248-4048. nani Y URS You’ll love what you find in the Missouri Valley Shopper In print and online @ www.missourivalleyshopper.com 605-665-5884 Gold and Silver Can Protect Your Hard Earned Dollars Learn how by calling Freedom Gold Group for your free educational guide. 888-488-2921 (MCN) Highspeed Internet EVERYWHERE By Satellite! Speeds up to 12mbps! (200x faster than dial-up.) Starting at $49.95/mo. CALL NOW & GO FAST! 1-877-789-9086 (MCN) IF YOU USED THE MIRENA IUD between 2001-present and suffered perforation or embedment in the uterus requiring surgical removal, or had a child born with birth defects you may be entitled to compensation. Call Johnson Law and speak with female staff members 1-800-535-5727. MEDICAL CAREERS begin here - Online training for Allied Health and Medical Management. Job placement assistance. Computer available. Financial Aid if qualified. SCHEV certified. Call 800-510-0784 www.CenturaOnline.com nani Please Recycle When Done Reading! Miscellaneous REACH 2 MILLION HOUSEHOLDS! Do you have a product, service, or business that would be helped by reaching over 2 million households throughout Iowa and the surrounding states? The Midwest Classified Network will allow you to reach these potential customers quickly and inexpensively. For more information concerning a creative classified ad call this publication or Midwest Free Community Papers at 800-248-4061 or get information online at www.mcn-ads.com (MCN) ROTARY INTERNATIONAL Rotary builds peace and international understanding through education. Find information or locate your local club at www.rotary.org. Brought to you by your free community paper and PaperChain nani SAVE on Cable TV-Internet-Digital Phone-Satellite. You've Got A Choice! Options from ALL major service providers. Call us to learn more! CALL Today. 888-583-4941 (MCN) WORK ON JET ENGINES Train for hands on Aviation Maintenance Career. FAA approved program. Financial aid if qualified - Job placement assistance. Call AIM (866) 854-6156. nani 1850 Agriculture Wanted to buy: Flat top fenders for 656 or 856 IHC. (402)360-2309 Call Classi?eds 665-5884 GUBBELS SALVAGE “Your Truck & Trailer Headquarters” trucktrailerinc.com Picture it Miscellaneous 1815 DISH Network. Starting at $19.99/month (for 12 mos.) & High Speed Internet starting at $14.95/month (where available). SAVE! Ask About SAME DAY Installation! CALL Now! 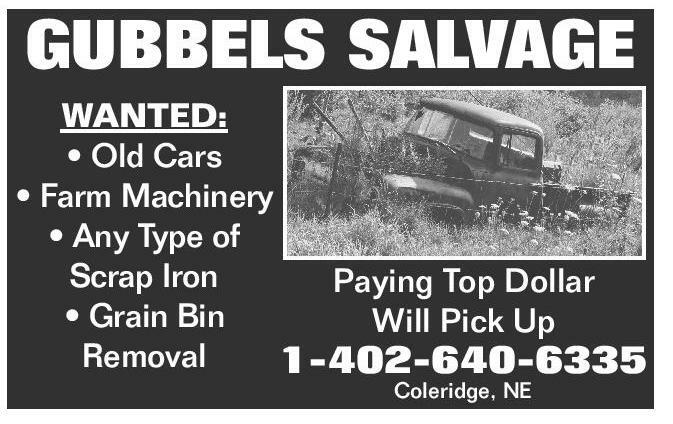 1-888-543-6232 (MCN) TRUCK TRAILER WANTED: • Old Cars • Farm Machinery • Any Type of Scrap Iron Paying Top Dollar • Grain Bin Will Pick Up Removal 1-402-640-6335 Coleridge, NE SALES & SERVICE, INC. East Hwy. 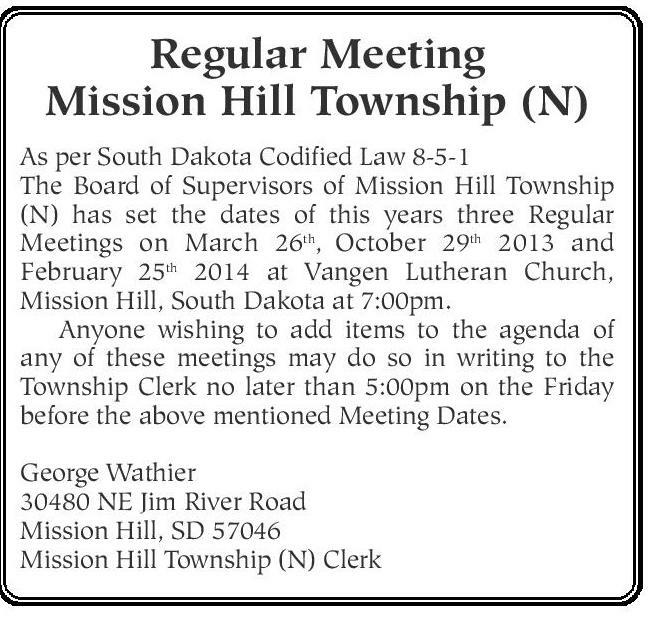 50, Yankton, SD • 605-665-7952 Regular Meeting Mission Hill Township (N) As per South Dakota Codified Law 8-5-1 The Board of Supervisors of Mission Hill Township (N) has set the dates of this years three Regular Meetings on March 26th, October 29th 2013 and February 25th 2014 at Vangen Lutheran Church, Mission Hill, South Dakota at 7:00pm. Anyone wishing to add items to the agenda of any of these meetings may do so in writing to the Township Clerk no later than 5:00pm on the Friday before the above mentioned Meeting Dates. 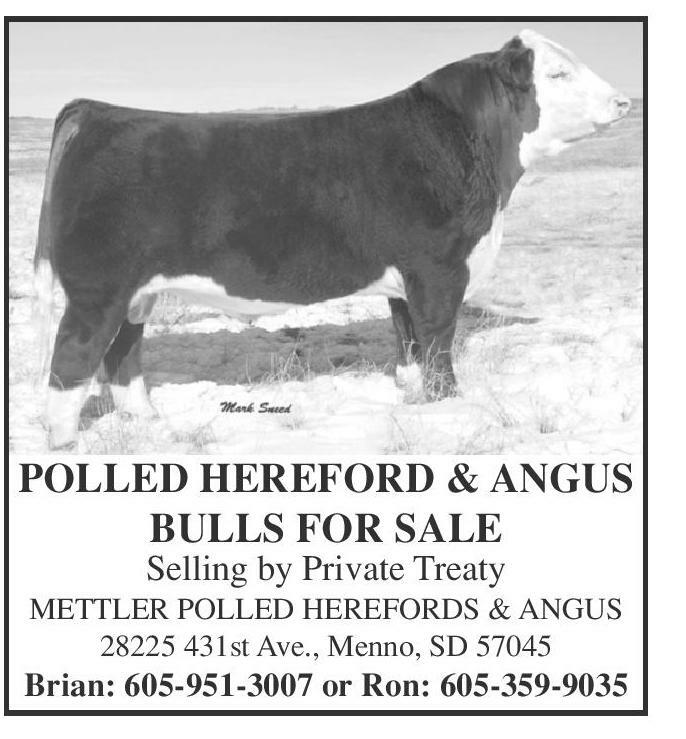 George Wathier 30480 NE Jim River Road Mission Hill, SD 57046 Mission Hill Township (N) Clerk POLLED HEREFORD & ANGUS BULLS FOR SALE Selling by Private Treaty METTLER POLLED HEREFORDS & ANGUS 28225 431st Ave., Menno, SD 57045 Brian: 605-951-3007 or Ron: 605-359-9035 Find BIG Savings… When You Place Your Ad in the Classifieds!